she aparently shook her eerz too mutch and gayv wun of them a reely big aura … aurora … aurora borealis hematoma wot reekwired surdjeree and menny menny menny stitches to repair!!! she wil hav to be in the kone of shaym with her hed rappd up for three weeks!!! now i no that in the past saya and i hav had owr diffrenses like abowt wether or not i shud play with or and wether or not she is reely a dog however beeing put in the kone of shaym for almost a munth is not a fayt i wood wish on ennybuddy!!! 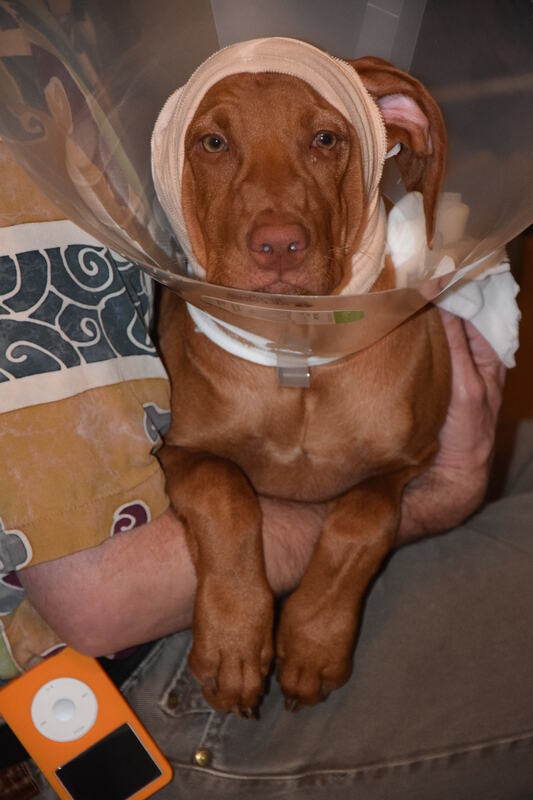 Poor little Saya…sending a full and speedy recovery…Hugs to you Dennis!!!! We’re sending tons of AireZen and healing vibes to Saya! Get well soon, cutie! 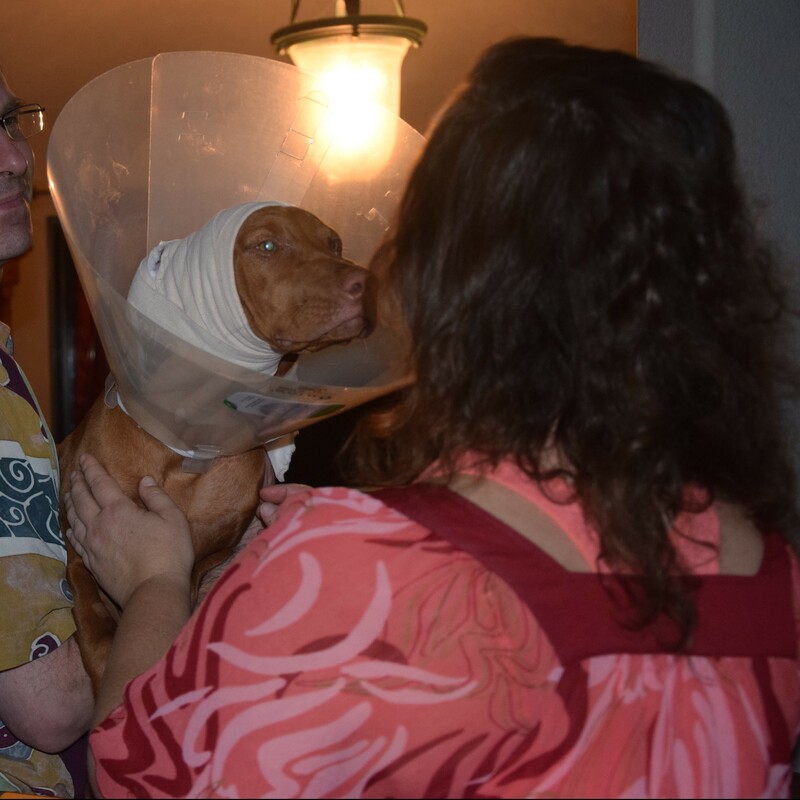 We ended up getting one of the fabic cones & really liked using it with our dogs when we had to. Search comfy cone on Amazon. Ouch! Poor little girl! POTP sent. 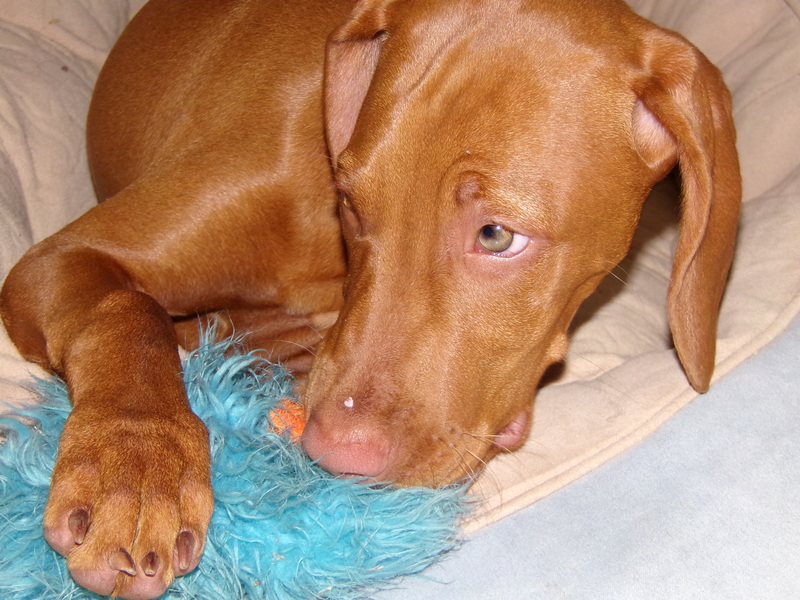 Maybe you can lend her your Treat & Train so she can get lots of rewards for settling and other low-energy activities. Poor sweet Sis. We all send healing purrs and prayers to sweet Saya. Poor Saya. We have our paws crossed tight for you and your pawrents and hope you get better soon. Oh, poor Saya. What a terrible fate to have to wear the cone of shame for a month. We hope she behaves herself – no head shaking – so she heals completely. We send the POTP to all of you. Oh no, poor Saya!!! We don’t like to see any of our pals in the cone of shame. All paws crossed for a good healing. Just tell her that the cone of shame is an Elizabethan collar, an important fashion statement. It works around here. Little girl Saya ! 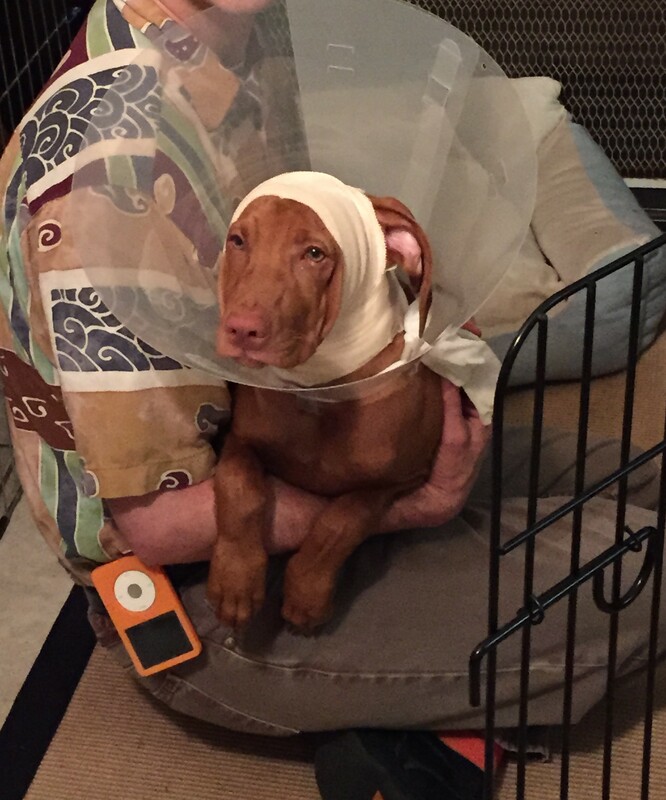 I am so sorry for this ear injury you suffered. I am sending the power of 8 paws to you for quick healing. (that’s 4 from me, Stella, and 4 from Zkhat who has wicked good powers.) So how many stitchings did you get on your ear? Its important to know this so you can describe how serious it was, like the surgery took four hours, withn 54 stitchings, and 2 pints of bloods. This is just an example, Saya, you use your numbers! Oh, poor sweet baby! A MONTH in the cone! Ugh. I hope the time will go by quickly. Sending pawsitive thoughts out to your whole crew! I hope Saya feels better soon….poor thing. Take good care of her Dennis and say hi to the beautiful Trixie! Saya? Did anybody look inside of your ear to see what all the shaking was about??? I had to wear a cone of shame when I first cme to Casa de RottRover cuz I got my, no, I got tutored. I licked anyway and got a big infection, so do what Dennis tells you to do – but only with regards to the CONE!! NOTHING ELSE, SAYA, PROMISE!! Thank you, Dennis, for letting us know about your little sister. Good greef mee ran off fur a few weekss an here iss poor Saya all messed up!!! Shee DOESS look pawthetick doesn’t shee Dennis??? Poor gurl>>>mee iss sendin POTP to her an yur Pawentss!! Oh, get well soon Saya! We are all about taking photos for future blackmail purposes! Keep that camera handy, Dennis!